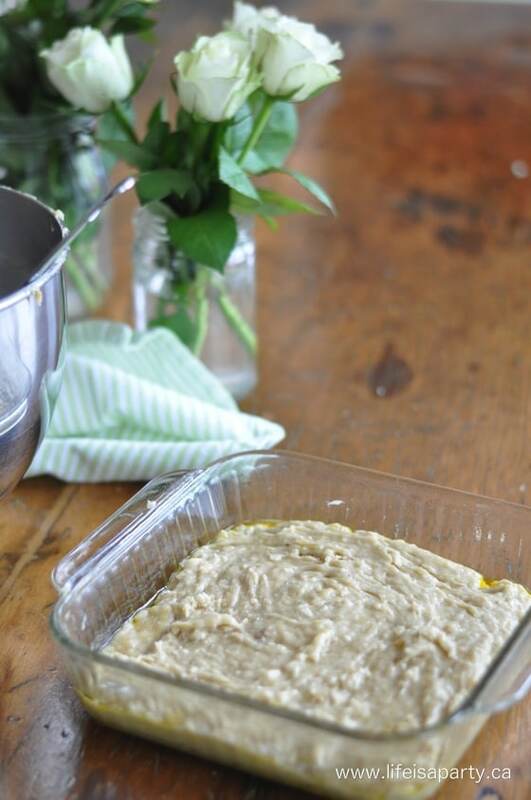 Easy Banana Cake Recipe -easy one bowl banana cake, perfect for using up ripe bananas, with the perfect simple fluffy vanilla icing. My mother-law uses this recipe to make an easy banana bread…because that’s what good, using up the left over bananas, responsible people do. But people who want life to be a party, they want to turn banana bread into CAKE! They want cake, covered in icing. 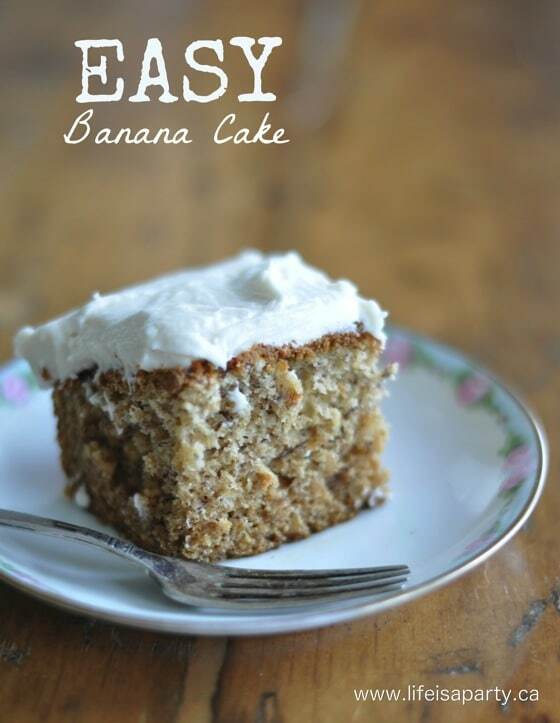 They want Easy Banana Cake! 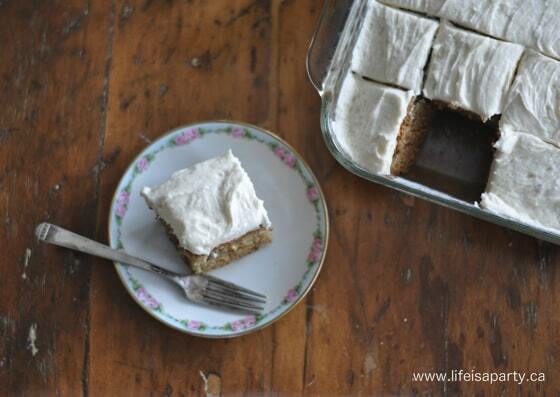 So, let’s make banana cake covered in sweet, fluffy vanilla icing, ‘cause that’s how we roll around here. And, it just happens to be super easy, like make this baby in the middle of the week kind of easy. In the bowl of a stand mixer fitted with the paddle attachment, mix the bananas, sugar, egg and butter until well combined. Add the flour, salt and baking soda, and stir until well combined, but being careful not to over-mix. Bake in a greased 8 x 8 baking dish at 350, for around 40 min, until a toothpick inserted in the middle comes out clean. After the cake is cool, combine the icing ingredients in a mixer and stir slowly until well combined, and then at higher speed until light and fluffy. Top cooled cake with icing, and enjoy. 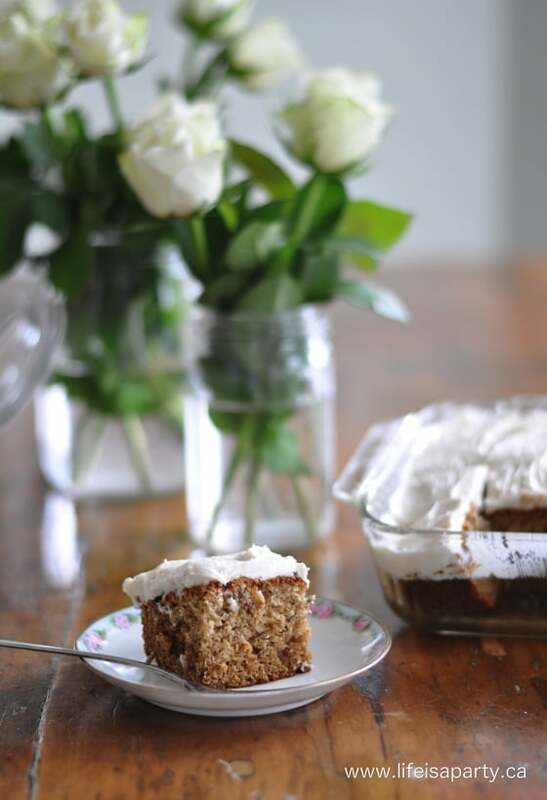 With a simple little Easy Banana Cake Recipe like this on a regular old Tuesday, life really is a party! Enjoy. Looking for another easy banana recipe? 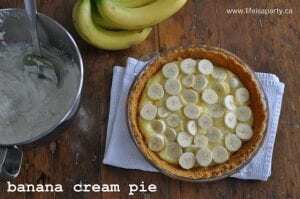 Check out this Easy Banana Cream Pie recipe. This recipe does look fabulous! I love bananas and looking for new ways to use them! Pinning! Thanks Thea, and it’s super easy too. Pearl, those sound like great changes. So glad to hear you loved it too. Thanks Cheryl, so glad you like it, and thanks for taking the time for the lovely comment. Can you use any kind of frosting? Yes, any kind of frosting you like, or no frosting if you’d like more of a banana loaf. Thanks so much, so glad you loved it! Can i double the ingredients if i want to make big cake ? Hi Sarah, I don’t see why you couldn’t double it for a larger cake. You might need to increase the cooking time a little too. Let us know how it goes if you do. Gracie, thanks so much. I’ll have to try it with brown sugar, thanks for the tip! This has become a go-to recipe! I have Celiac and found substituting Pamela’s GF mix in lieu of flour works perfectly. I made it again this Sunday morning to use up bananas. Delicious and quick. Thank You for sharing! Dana, thanks so much for the gluten free tip. So glad it’s a favourite recipe of yours too. Hello, great and quick recipe, it was a hit with the family. Just wondering if I can make it into a loaf pan, do you know what the bake time would be if I can? Thank you! Hi Nirvi, It works great as a loaf too. Bake for 50-60 min. at 350 -a toothpick stuck in the middle should come out clean when it’s done. Marisa, thanks so much for the lovely comment. So glad you enjoyed it.